From the time rebuilding efforts began in Houston following Hurricane Harvey, this industry-leading manufacturer of innovative flooring products has been partnering with Good360 to help recovery efforts in Texas. Their products have been integrated in homes across the region and have given hope to countless families. The latest application of their product is nontraditional, but no less impact than previous installations. In partnership with All Christian Fellowship, this flooring retailer was used to help rebuild a low–income housing development and will be instrumental in bringing a community back to life. Common practice after a flood is to help the homeless and homeowners, but renters are often left to the terms of their rental insurance policies. The justification (right or wrong) is that while renters have lost many of their belongings, they can move to a new rental while the same option does not necessarily exist for homeowners. Similarly, apartment landlords must also rely on insurance policies to address damage to their properties. There is sometimes a gap between what the insurance will cover and what repairs are truly needed. Some lower income renters may be at risk of living in substandard, dangerously unhealthy homes, either because they can’t afford to leave or because the landlord can’t afford the repairs. Demand will always exist for low income housing. Landlords without adequate funding to rebuild may choose to paint over mold and structural damage. When it comes to either living in a shelter or having some semblance of a home for their children, many renters will choose the latter. This gives them comfort in the short term, but can lead to serious health problems in the long term. In addition to health problems caused by dangerous housing, renters do not traditionally recoup security deposits. This leaves them in a difficult position when trying to obtain new housing: do you pay the security deposit necessary to move elsewhere, or buy the clothes you need for work or to send your kids to school? All Christian Fellowship, a church nestled in the neighborhood of northeast Houston, recognizes this quagmire. The church partnered with a low–income housing community to rebuild housing and, with a rent control agreement, gave hope back to residents who had none. All Christian Fellowship’s work began shortly after Hurricane Harvey hit. They started with local food and clothing drives, but before long they realized that more was needed. 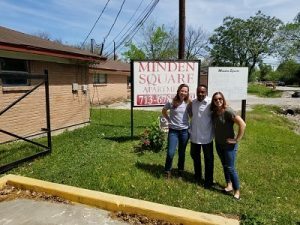 The church partnered with the apartment community because they knew that, without finding a home for members of the community who had been put out by Harvey, the area would not recover. The pair then reached out to All Hands and Hearts, who provided volunteers and supplies to clean the existing mold and flood damage out of the facility. All Hands and Hearts’ work in the community ensured that Good360’s donations would furnish safe, clean units for residents to move back in to. With help from groups like All Hands and Hearts and Good360, the affordable housing renovation continues today. 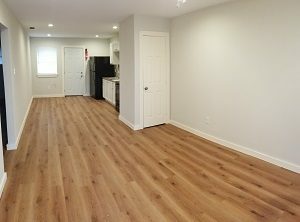 34 out of 49 units have been renovated, many with flooring products. All Christian Fellowship’s work in the area demonstrates that they are stronger together. Good360 looks forward to partnering with more organizations which look for out–of–the–box solutions to classic problems, like how to help apartment residents after disasters. We are happy that partners like this manufacturer remain committed to disaster recovery, and to helping survivors regain a sense of dignity and live in healthy, safe environments.